of height of approximately 16". and are re-usable, you can make many hats for years to come!!! for a straw kit (includes both straw and glue). This adorable "fanchon" style hat comes to you from the pages of La Poupee Modelle magazine. We have created a form for this hat to give it a more soft, round look on the crown, which is not possible with a flat pattern. 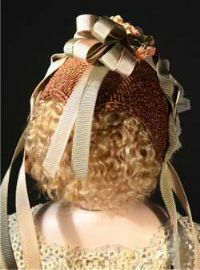 It is a great hat that is so versatile and very easy to decorate. Click on photo for larger, clearer view. 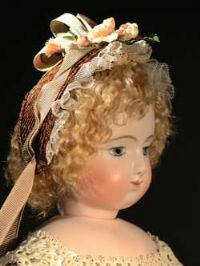 NOW available for the smaller 6 3/8" circumference head of a 16" fashion doll. Requires approximately 7 yards of 1/4 inch hat braid sold separately or as part of a Kit. Straw Kit includes: Braid, Glue & Millinery Wire. Please check the kit checkbox to include the kit as well as color choice. You may order the kit in any color you want, at no additional cost, providing the color is on the pull down menu of straw colors at the time of your order. Include your color preference in the message part of your order. 16" French Fashion doll Dress Form. 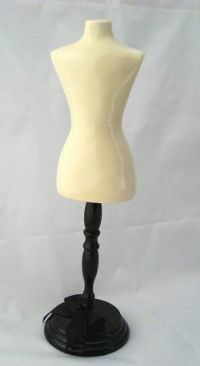 We have created this new dress form to fit your wonderful costumes for 16" French Fashion dolls. This form was modeled after the 12" French body from Germany. Used to display doll outfits or help when sewing clothing to ensure a perfect fit. I am actually working on a dress form modeled after the new resin French Fashion body. It is a very true replica as far as meausrements. It should be ready in the next two weeks. I also have a dress display that I sculpted a few years ago but never got posted to the website. It is a beautiful display. Will post pictures next week. Thanks for looking. PNBDoll.com �2005-2019 All rights reserved. No portion may be copied or redistributed in any form without permission.